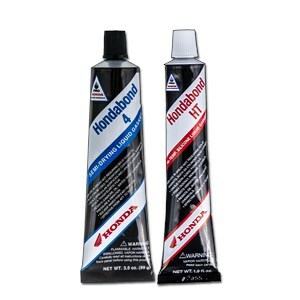 Hondabond HT – High-temperature, silicone liquid gasket. Unique formula is nonacidic and won’t corrode aluminum like other silicon gasket products will. For use in applications not requiring solid gaskets. Hondabond 4 – Semidrying liquid gasket. Seals irregular surfaces with a tough, elastic film. Solvent-based for easy removal; also resists gasoline.